These testimonials are from individuals who have undertaken CLI's Power Coach� training. Each Power Coach brings their own personal success stories because of their commitment to personal excellence. 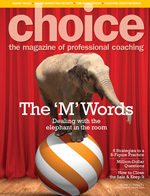 Before one can become a great Power Coach you are expected to "work on yourself" as well as "work with your clients". These Power Coaches have a strong commitment to be of the highest service and bring more meaning and peace into the lives of their Business and Life Coaching Clients. ... I'm very happy that I've taken the first in the series of training courses in Power Coaching� with Mind Kinetics� through Coaching and Leadership International. Already it has helped me overcome roadblocks to goals that I've been wanting to achieve for years. I've also learned important strategies for being kinder (and by that I mean less judgemental) towards myself and others, personally and professionally. And I've been fascinated by the thought-evoking, heart-connecting and challenging methodologies that CLI has created to help me � along with those in my sphere of influence and my potential clients � lead more enlightened and compassionate lives for a healthier planet. ... Besides a very good friend from Pender Island being taken to the hospital with serious heart issues as I write this ... I am faced with some major life challenges. Am so super grateful for the Mind-Kinetics� tools, I cannot even begin to tell you! Am not staying stuck in any place too long and am moving forward with more innovative ideas, one respectful step after another and releasing some major grief. It is all ok and needs to happen ... it just takes up a lot of time, considerations, until I (we) am settled again. Am working on that. I want it all to happen with utmost love and respect for one another. Not easy but attainable. Juggling lots of balls right now. Am grateful for the learnings I am receiving from CLI. Am absorbing them deeply and get to test them right away on myself, right after class!! That is amazing and telling of their effectiveness to me wonderfully. I mean that ... am filled with wonder around that!! So are my close friends who are amazed how well emotionally, (allowing for ups and downs), and swiftly I am navigating this complex situation. This is to inform you that I have passed my ICF ACC examination and I am certified as an ICF ACC. This was possible because of my training and guidance received from CLI � John Burr & Betska K-Burr in particular. I would like to place on record my sincere thanks & appreciation to you John & Betska for all the inputs ,training, support guidance in my journey in becoming a coach. I am deeply grateful to you both for this achievement. I am happy to inform you that today, I appeared and have passed the ICF CKA test. John, I appreciate all your help and guidance in my efforts to clear this Coaching Knowledge Assessment test in my first attempt. Your tips and insight helped me a great deal in preparing for it. Thank you. I am happy that I have successfully completed the rigorous and very strong CLI curriculum for the CPC, Certified Power Coach�, designation. You...Betska and John....and all of the CLI Coach Training instructors have been great teachers and mentors. I enjoyed every moment of my work with you. Thank you once again and warm regards. I have been mentoring a lot of people for the past 7 years, helping them see different perspectives of a challenge they think exists in front of them. They suggested me to do a certification since I was good at it and I could not have found a better platform than CLI. I have experienced miracles through the coaching methodologies of CLI. I am honored to be a CLI Associate Power Coach�. I thank you for the amazing idea of creating PCMK� and for how you inspired me to love people, animals and our planet. I feel already that the air, which I now know how to breath in, is more clean and pure. I wish I get the kind of wisdom that you have so that I might share it with all the people I meet. With PCMK� I became stronger and my life is full of enthusiasm and energy. In September 2014 when I started CLI�s program, I was an agnostic, but now I know that somewhere far away in Canada, live my FIRST spiritual teachers. They will remain in my mind and my heart forever. God bless you Betska and John ! Thanks a lot from the bottom of my heart. Deep gratitude for the amazing opportunity that you gave to me, for all of your support throughout the CLI Mind-Kinetics� Coach Training learning process and also for your encouragement and wishes for a bright future. Power Coaching� with Mind Kinetics� works and it works consistently! In my work as an internal coach and trainer for a large national accounting firm, I have found Power Coaching to be a tremendous asset to our organization. Power Coaching assists our partners and managers to discover and remove blocks, negative thinking and beliefs resulting in an enhanced capacity for leadership. Benefits that the coachees' have identified as a result of their experience in coaching include: increased self awareness, increased job satisfaction, enhanced communication skills, lower stress levels and a positive behavioural changes. In a recent survey of those who participated in our internal Power Coaching service, 100% found the coaching sessions to be effective and they stated that they experienced a change in their perception, behaviour and/or attitude. More importantly 67% indicated that they received feedback from others stating they noticed a change in their perception, behaviour and/or attitude. ...last week when I met you again I found "myself"! "What awe- inspiring days I spent with you, last week, learning PCMK! I am blessed to have you as my Guru Coach! I must tell you that those 4 days have been the most soul- stirring days of my life. I am still sinking in and soaking in all the positive energy you showered on us! The first time I met you on Dec 8th in Mumbai...i found my "calling" and last week when I met you again I found "myself"! I missed the opportunity to thank John for a wonderful learning experience. You are a great speaker, a generous teacher and also have an amazing sense of humor that kept me awake at times on some more exhausting days. I enjoyed every class with you and learned a lot! I so much appreciate being able to go on the CLI Website Members Area and listen to recorded examples to bring my skills up to speed. Thank you for making the CLI web site so valuable to your coaches. ...a method that is truly empowering and transformative! The CLI program has provided me with proven methodolgies that have increased my knowledge and skill as a seasoned coach. My clients and I have benefited tremendously from the CLI unique approach to whole-person coaching - a method that is truly empowering and transformative! I would like to express my heartfelt gratitude to co-presidents of CLI John Burr and Betska K-Burr for their wonderful guidance and instruction and thank you also to teachers Anny Tenbult and Joan Weston. "There are over 140 different coaching schools. There are qualitative differences between these schools. One of the best, Coaching and Leadership International, is here on Vancouver Island." ... find the same sense of self and take control of their own lives. Personal Empowerment for me is a journey ... To have the tools and ability to take a different look at the journey is a very powerful and fulfilling thing. The skills I have been learning through CLI�s Power Coach training allow me to look at why I am stuck and find ways through whatever is blocking me. That brings the feeling of fulfilment and allows me to realize the choices I have. Power Coaching also allows me to help others find the same sense of self and take control of their own lives. That is the best Personal Empowerment there is! ... you are a global leader in this work! It does encompass mind/body/spirit. Thank You! I Just want to quickly express my thanks for today's webinar. I so appreciate the time and energy you put into helping people become the best they can be. Sandra's presentation was concise, easy to follow and understand. I learned a great deal as she was able to take the 'overwhelm' out of the equation and replace it with exciting knowledge. It also helped me to see that I am on the right track so it is a celebration for me. "CLI's Coaching Program has provided me with many insights for success in my personal and professional life." "Having already taken a coach training program by a reputable organization I still wanted something more. I found this with CLI. The difference being in CLI's personal touch and overwhelming concern and compassion for their coaches success and well-being. I believe that any coach or anyone considering being a coach would find CLI's approach unique, and unparalleled within the coaching industry. The founders, John Burr and Betska K-Burr are living examples of the powerful transformative effects of their program." "As a Counselor, Power Coaching with Mind-Kinetics� provides me with the missing piece of the "therapeutic process" puzzle. Counseling explores my clients' past patterns, and Power Coaching helps my clients look at their present, with an open mind and heart, in order to create a future they've always wanted." Dear John and Betska. I would like to honor you both for the gift of Power Coaching! I started my day with a coaching session on myself, and once again I can only say wow. The process works. It always takes me to places I didn't even know existed in myself. I am always left with a feeling of Oh My God, I didn't know I did that, but also with a feeling of self love and joy. The process is kind. Do you know what I mean? So, I honor you both. In loving Gratitude. "John and Betska are phenomenal leaders, teachers and motivators. Thank you!" "CLI teaches a cutting-edge program that asks those who are willing, to look in the mirror, own their actions and let go of issues in order to see the truth within themselves. I recommend everyone, including all levels of personal development, complete this program and experience, first-hand, the power of identifying self-development in all areas of life." "For me, Level I and II were a great foundation for self-discovery, communication and exploring The Laws. Level 3, however, took me to amazing personal growth where I am now able to spiritually hover above and see the intricacies of connection in all relationships. I feel like a new woman, so much stronger and more aware for myself, my family and my clients." "This has been for me an in-depth internal self-discovery journey which has allowed me to open my mind and make permanent changes affecting all areas of my life. My greatest learning has been to gain a very good understanding and ability to transform unconstructive thoughts, words, behaviours into permanent positive patterns and secondly to be able to use more of the right brain and become a bilateral thinker." "Betska and John have created an exceptional program that has supported me to work with clients in an atmosphere free of judgment. They place the emphasis on Compassion for our fellow humans and to generate an attitude of Loving Presence where the client fully takes responsibility and has primary interest in their own renewal - that is the special strength of this training program, from my experience. The skills they teach to access our full power of Being and Acting, are a joy to explore and invariably produce great results for my clients, as well as for my own inner growth." Contact CLI to find out how you can add your success stories to these pages.